Castlemere is proud to present HERON FINE CHINA of England, creators of personalized Bone China giftware. 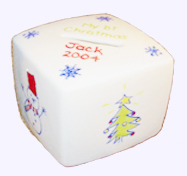 Each keepsake is completed with care, using the traditional skills of Hand Gilding and Enamelling. 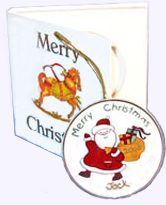 As a special touch, your keepsake gift is shipped from England directly to the person to whom you are presenting the gift. A delightful surprise! 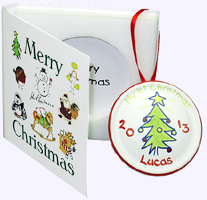 A card will be sent to the recipient notifying them that a special gift from you is on its way and will arrive within 3 to 4 weeks. Each keepsake is personalized and makes a perfect commemorative birth gift or christening gift; an elegant addition to baby's room to be treasured for a lifetime. See all collections. Please Note: Order must be received by November 22 for Christmas Delivery. "Merry Christmas" or "My 1st Christmas" is hand lettered at the top of the frame. The child's name and Christmas year will show underneath. All are hand lettered in enamel color. A maximum of 12 letters is allowed for the child's name. 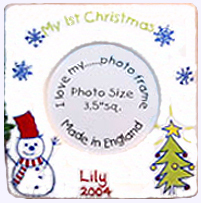 Photoframe is 5" x 5"
A traditional Christmas design decorates the sides of the bone china money box with hand painted snowflakes atop each corner. On top "Merry Christmas" or "My 1st Christmas" will be hand lettered in enamel color, along with the child's name and year. A maximum of 20 letters is allowed for the child's name. The Bank is 3.25" tall. A decoration in a card. 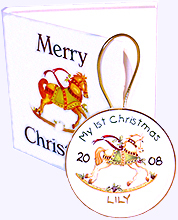 "Merry Christmas" or "My 1st Christmas" is hand lettered in enamel color at the top of the ornament. The child's name is hand lettered at the bottom of the ornament. A maximum of 12 letters (one name only) are allowed for the child's name. The ornament is 1.5" in diameter.